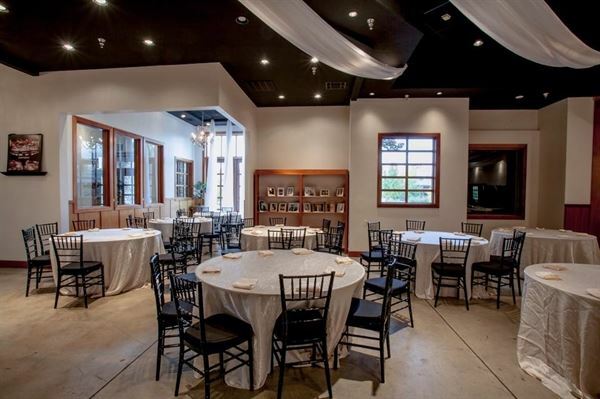 The Petite Ballroom available for smaller events like seminars, meetings, parties, banquets, weddings, receptions, rehearsal, dinners, birthday parties, Christmas parties, graduation parties, engagement dinners, reunions and anniversaries. • Prices include tables and chairs for 10 - 80 guests. • Military discounts and Special Pricing offered • If events scheduled less than 90 days from time of appointment Room pricing includes: 1. Set up and take down of all tables, chairs, buffet, lounge, and bar area 2. Tables, chairs, and set up and take down 3. Included in our house catering and bar services are your linens (dining tables, buffet table), glass/stemware, and china. 4. Consultation, meeting, and configuration for the day of the event Petite Room Rental Rates: Sunday – Thursday - $500 Friday – $700 Saturday – $700 Please visit our site for complete details. The Grand Ballroom is available for larger events like seminars, meetings, parties, banquets, weddings, receptions, rehearsal, dinners, birthday parties, Christmas parties, graduation parties, engagement dinners, reunions and anniversaries. • Prices include tables and chairs up to 175 • Military discounts and Special Pricing offered • If events scheduled less than 90 days from time of appointment Room pricing includes: 1. Set up and take down of all tables, chairs, buffet, lounge, and bar area 2. Tables, chairs, and set up and take down 3. Included in our house catering and bar services are your linens (dining tables, buffet table), glass/stemware, and china. 4. Consultation, meeting, and configuration for the day of the event Grand Ballroom Rental Rates: Monday – Thursday - $1050 Friday – $1950 Saturday – $2450 Sunday -- $1650 Please visit our site for complete details. The Petite Ballroom has a very contemporary Style with natural light coming in and can accommodate small groups between 10 and eighty guests depending on the type of event scheduled. We held our daughter's wedding reception at Waters Edge. This is the second time we've used the venue for a reception. The staff was very friendly and Ben (the manager) did a fantastic job as our DJ. Our out of town guests were very impressed and everyone reported that they enjoyed themselves immensely. Planned a wedding on sunday afternoon and everything was perfect. The food was excellent, the staff was so nice and helpful. Ben was so easy to work with and so nice. Thank you all so much and we will definitely recommend Waters edge. The venue is located at a great location. It is super clean. The food was really good and as promised. The staff was super attentive. They made my daughter very happy because they provided everything she wanted. Everything went just as planned thanks to Kevin! Special Features: No curfew, adjoining Waterfront covered patio! In-house catering offering a nine-page extensive and themed menu...ranging from $12.50/pp..on an average of 18 to $20pp! A MUST SEE Bridal suite & Grooms room! Full premise Bar! TURN KEY!